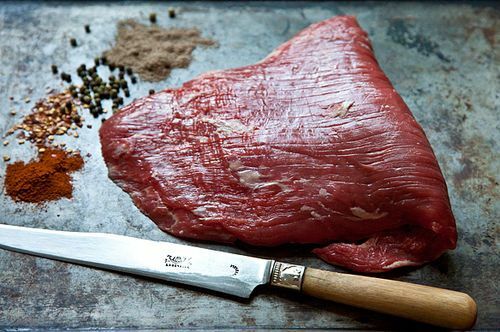 Between now and next Thursday at midnight, we want to see Your Best Flank Steak. For more details and to enter the contest, go here. sorry to be missing this one. my favorite cut. but so happy to be in Italy and France with the daughter. lots of eating and cooking adventures to recount. on to Paris tomorrow. watch tv next Sunday and look for us at the conclusionof the tour de france! you could enter your pizza maker's steak & you steak sandwich, n'est pas? With flank steak, the grain is a little easier to see than on some other cuts. In the photo above, for instance, you can see there are what appear to be lines going from left to right on the steaks surface. This is the "grain." To cut against it, cut across these lines. Hope this is helpful! see the lines/ ridges in the steak ? running from left to right ? Thats the grain. And slice a wee bit on an angle.... not straight down on the steak.